Like: Classes for all fitness levels. I don't have to go outside in winter. Don't Like: Expensive. Not great for flats. Oh, and it's not available (at least not yet) in the UK. 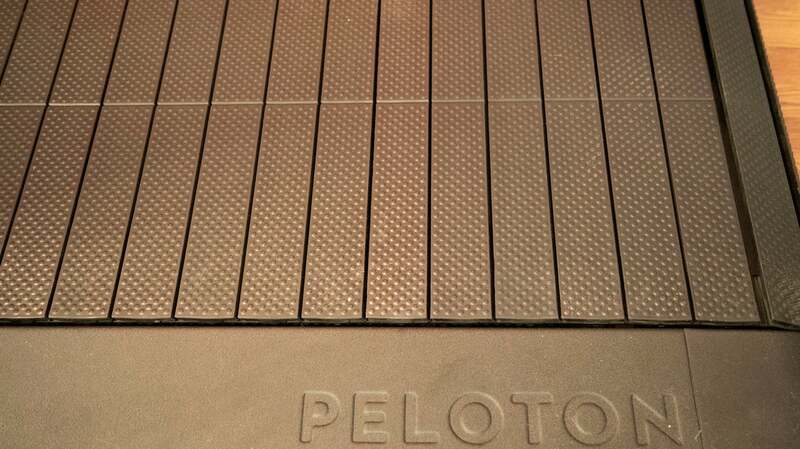 In its ability to maximise the efficacy of your workout, the Peloton Tread is excellent. Compared to other home treadmills, it comes with a 32-inch HD touchscreen so you can stream live and on-demand classes. There are over a thousand classes you can choose from, plenty of instructors with their own personalities, and a good number of metrics you can track straight from the screen, like heart rate (though this requires a compatible ANT+ heart rate monitor), distance, and pace. You can also automatically share your workouts to Fitbit and Strava, if you’re already hooked into those platforms. The classes are the best part. I’ve been running for years, and like anyone else, my progress has confronted ruts and plateaus. (Full disclosure, I also have periods where I fall off the fitness train and onto my crisp-stained couch.) Part of the problem is getting bored with apps like Runkeeper or doing the same few fixed interval workouts. On the Peloton, I tried out beginner, intermediate, and advanced classes and was pleased to find they were all challenging for their skill levels, but not to the point of immediately throwing up my arms and giving up, or waking up in immense pain the next morning. Over the three weeks of testing the machine, I found myself improving at a faster speed than when I would look up running workouts online. An intermediate 30-minute hills run I tried involved a short warmup with jogging, followed by instructor-led intervals of increasing difficulty. For example, you might start with a jog somewhere between 3-4.5 mph, amp up to a straight run somewhere between 5-6.5 mph at an incline of about 6-9 per cent for about 90 seconds, and recovery jogs/walks at a 1-2 per cent incline at half the speed. You have the option of additional 5-minute warmups and 10-minute cool down classes, on top of the mild stretching each workout ends with. Peloton also gets kudos for instructors focusing on techniques and explaining things like why you might want to run at chicken-like 180 steps per minute as opposed to leaping like a gazelle through the air. Things like cadence, pace, and proper running form aren’t new concepts, but they can be hard to grasp for plenty of people just starting a Couch to 5K programme or trying to make good on New Year’s resolutions. Beginner classes, in particular, have an emphasis on proper form, as well as warmups and cooldowns. It also helps that every instructor injects some degree of positive perkiness. (Even if I occasionally find their musical choices to be questionable.) There’s a good chance you’ll find someone to your taste, and it is helpful to have someone tell me when to kick it up a notch, when to give myself a break, and what sort of exertion level I should be aiming for. But that’s the thing. 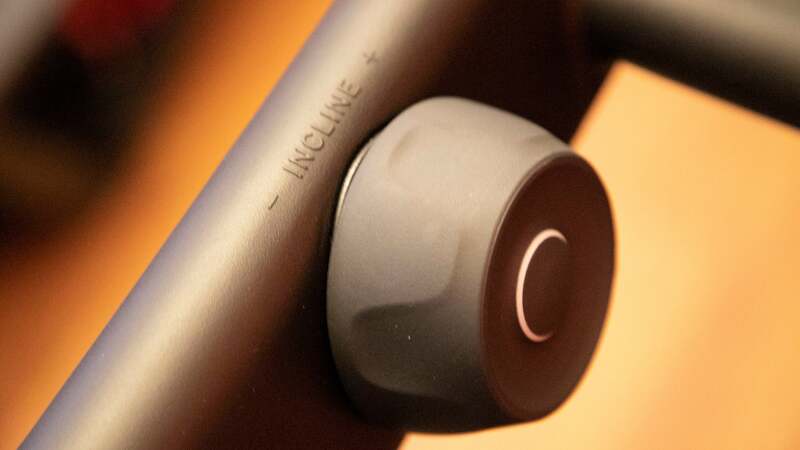 As much as I enjoyed how simple it was to roll out of bed and hop on the Peloton Tread, the machine itself isn’t necessarily worth the $4,300 minimum price tag. (Packages go up to $4,844/£3,676, or $202/£153 a month with financing, not including subscription fees.) Sure, it’s well-constructed, beautiful machine made from carbon steel. It’s easy on my knees and shins when I run on the 59 individually mounted, rubber-coated aluminium slats. The handrails feel nice when I’m hunched over and wheezing from a hard workout. It’s also gigantic. It took three Peloton delivery men to wrestle this thing into my moderately sized, only somewhat cluttered flat. They uttered phrases like, “This thing is like a tank,” and “Oh god my back.” Which makes sense because this thing has a footprint of 6 feet by 2.7 feet, and weighs a whopping 455 pounds. My janky floorboards bent a little under the weight. It dominates my living room. We had to move our TV distinctly off centre to accommodate it. My tiny dog sometimes stares at the large contraption in senile bewilderment. It’s also extremely loud. 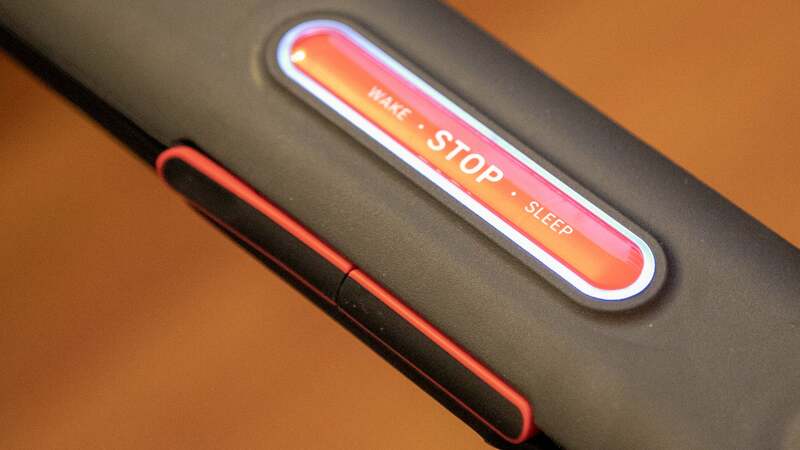 Of course, you’d never expect a treadmill to be quiet, but the Peloton Tread still isn’t the most subtle device. The ground shook when I ran, and things on my coffee table came precariously close to falling off. That makes sense—this thing goes up to a speedy 12.5 mph. But with its large size and hefty weight, it cements that the Tread isn’t suited to apartment living. I could hear when my flatmate was going for a run, and I imagine my neighbours could too. Another deft design touch is the Tread’s safety key. Basically, it’s a failsafe that if removed will immediately cut power to the treadmill. In the morning, my coffee-deprived arse has fallen face-first on a treadmill, so I am that nerd who always clips the safety key to my belt. It’s not that it’s so much better than the cheaper treadmills I’m used to—but the magnetic key wraps neatly around the middle bar for easy storage instead of just dangling from the machine. But none of these nifty design choices makes up for the price. 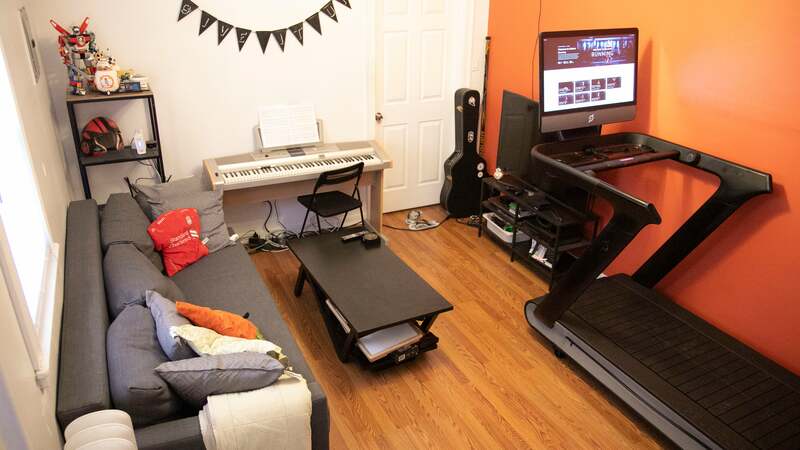 No treadmill is going to be cheap, per se, but you do not have to shell out a minimum of $4,300. And that number jumps up if you decide to opt for the exercise mat, dumbbells, or heart rate chest strap. Plus, that’s not including Peloton’s extra $40 (£30) per month subscription. This is extravagant when you can find a barebones treadmill for less than £200 on Amazon, and decent motorised ones in the £2,000 range. 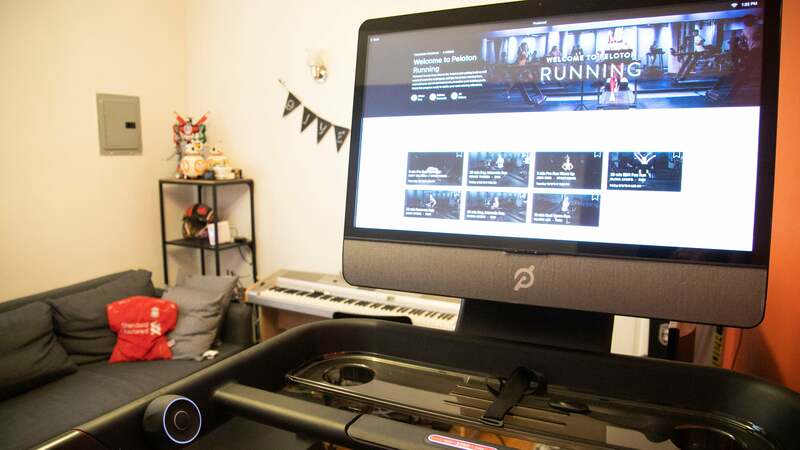 Sure, top quality treadmills will cost somewhere above £3,000, but again, those don’t come with a monthly subscription, and one of the perks of home exercises is eliminating pesky fitness fees. 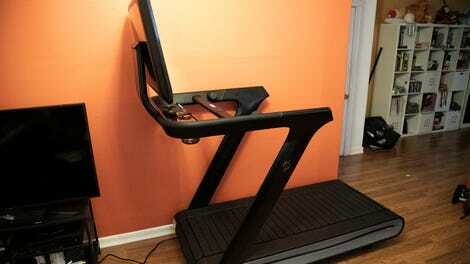 NordicTrack has some similar treadmills to the Peloton that are marginally cheaper. Its X22i Incline Trainer, for example, is about £3,000 and also comes in with built-in monitor for HD on-demand classes. And there are competitors' apps like Zwift which let you take classes with existing treadmills over Bluetooth. Both cost £13 a month and have their quirks. Zwift lets you run in virtual landscapes, but requires you to buy a foot pod. If the Peloton Tread’s best feature is its content, then there’s no reason you can’t download its digital app for iOS or Android for $19.49 (£14.82) per month—which is still pricier than, say, Zwift or Studio, but not by much if you find yourself actually liking Peloton’s content. You miss out on live classes, but that’s a minor sacrifice. It’s way more cost effective and delivers a similar experience if you just subscribe to the app and use your gym’s crappier treadmills. The app also gives you access to cycling, outdoor running, and floor exercises, on top of the “bootcamp” strength training workouts you get with the Tread. It is big and loud. Not for flat dwellers unless you’re rich and have a beautiful penthouse.